University Logo Tattoo on Human Hair: a Micro-Scale Rebellion? What do you do if you have a focus ion beam microscope normally used to make nano-devices, a scanning electron microscope and some spare time? Well, you etch your university logo onto a human hair, of course! At least, if you're the Engineering Dept at McMaster University you do. It's not the smallest logo ever— that's an IBM one with 35 xenon atoms, I believe. But it's possibly the ickiest, and it's certainly high resolution. Impressive. We've only got one quibble: the uni logo, guys? I'm sure Giz readers would be more imaginative. 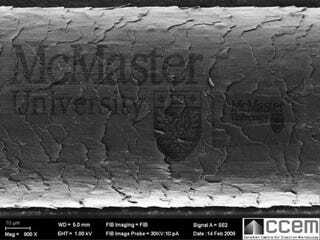 Now, this is done on a plucked hair by steering a beam of gallium ions over the surface to etch the 20-micron logo into the hair cells. But imagine you really could have your hair tattooed. No-one would see it, it would be just like painting the pilot inside a plastic airplane model: you'd know it was there. What would you have?